Bora and Elliot’s wedding day took place at the ever so gorgeous Grand Island Mansion which is located just outside of the California Delta town of Walnut Grove. They were married on a perfect summer day June were the temperatures weren’t too hot for a summer day. Right after the couple had eaten their dinner the sun was setting and I wanted to take them back outside for about fifteen minutes before all the reception events started for the night. 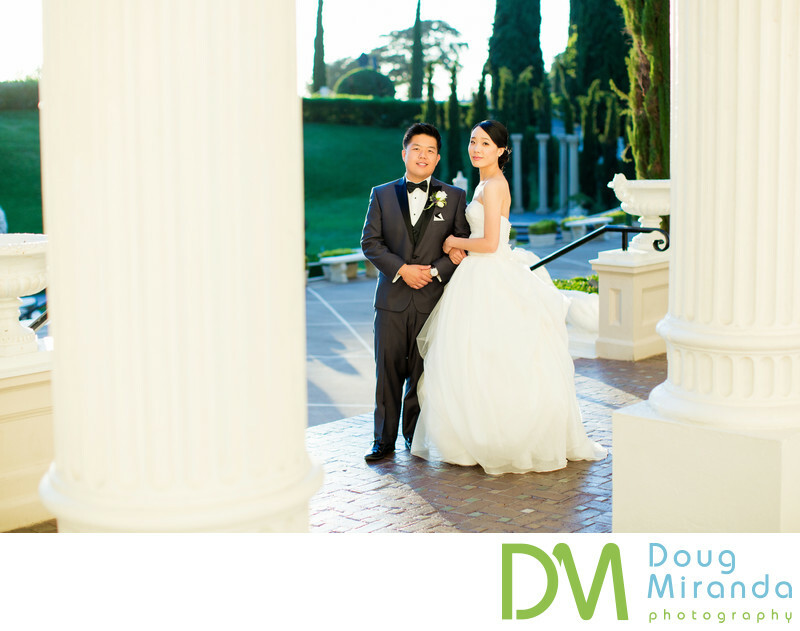 Bora and Elliot were dressed so eloquently on their wedding day, which matched the style of the front of the mansion’s huge pillars. The photo worked out prefect with the sun setting at their backs and with the giant white mansion walls acting as a huge reflector to add some light to their bodies. Most of the time I set up my couples in simple poses and let them do the rest with their facial and body reactions to let the pictures come to life. I placed the two of them right between the two huge pillars and had Bora cuddle onto Elliot’s arm. I walked around to a couple of spots taking photos of the two of them in this same pose and then found this perfect angle for the rest of the photos. The pillars acted as a frame and added depth to the photo at that same time. I just love this simple relaxed pose and the genuine smiles on their faces. Nothing looks forced at all in the photograph. It truly is a timeless photo that they will cherish for ever and remind them of the happiness that took place on their wedding day. Keywords: Grand Island Mansion (24).